I have lived in this house for over 20 years, and I can hardly remember a time that I didn't have this shadow box on my kitchen wall. This is it today. Not redecorated since I removed my Valentine's Day items. The pine shadow box was not painted when I purchased it. It was stained in a dark stain with no varnish or polyurethane. It was perfect for my cutesy country decor in the 1990's. Then I painted it red. Here is the shadow box in red back in 2011. This was the very first time it appeared on my blog. 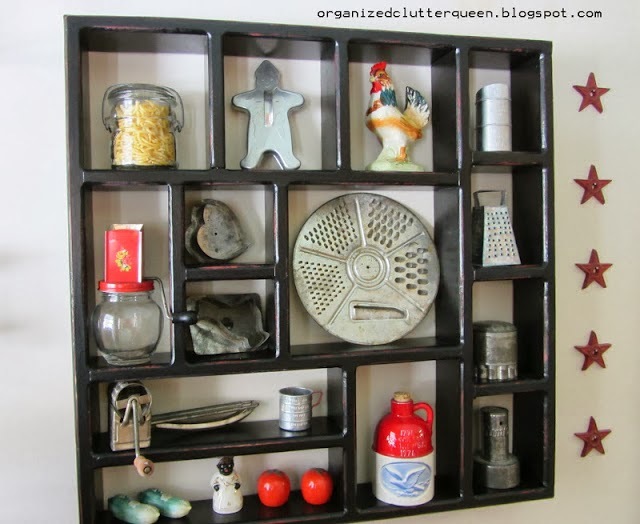 Shortly after Christmas, the shadow box was painted black and filled with vintage kitchen collectibles. I am changing up the kitchen wall displays, and the shadow box is going to go. It was a perfect piece for seasonal displays and small collectibles but I think I have exhausted my creative possibilities with the shadow box. I am working on one kitchen wall today. I think this old board will be on it. Maybe this repurposed drawer shelf too. Or maybe this framed flour sack. This little chippy stool may work in the kitchen. I hope you will stop back to see the changes! The drawer shelf is great, I think I need a few of these in my craft room!! I also love the chippy ladder-very cute. 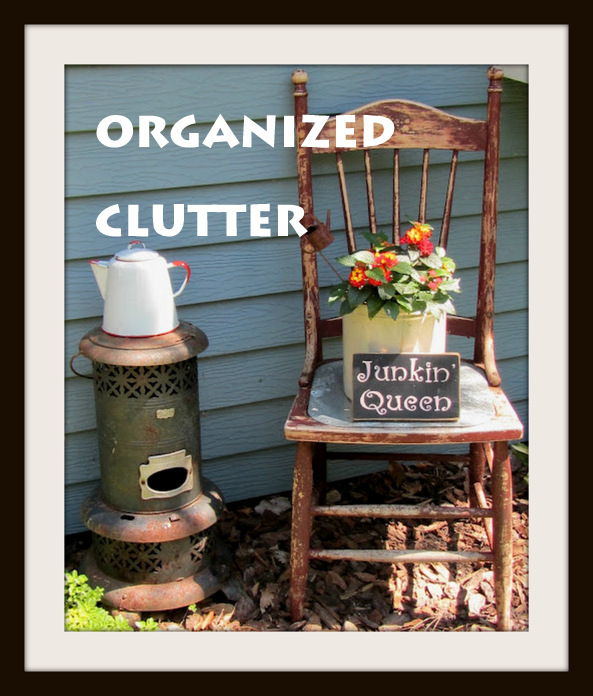 Love, love, love the repurposed wall shelf! In each of the consecutive photos, I can see you evolving as a decorator. Oh....poor little shelf. But I am sure whatever you put will be just as pretty! Yes I will stop by!!! I love the third picture!!!! I like it when it was red best but now it is no more....in the kitchen at least. Love all your "ingredients" for what's to come! Can't wait to see it. I enjoyed your shadow box but understand the need to change things up! I look forward to seeing the new look! You have certainly made good use of the shadow box, I love the way you arranged your vintage pretties. The drawer is a great idea, too! Great inspiration, something I'm lacking t the moment! How fun! It's always exciting to try something different after a long run with something. I'm in love with your drawer shelf! Love your shadow box, but I can't wait to see the changes that you are doing. I know it will be awesome!! I have always admired that shadow box and am kind of sad to see it go. I know you'll do something just as wonderful and I'll be back to check it out! I really like the shadow box and all the many different ways you decorated it; but I certainly understand the need for change. I look forward to seeing what you do. I get so attached to things and don't always like the changes I make that I end up putting stuff back where it was. That shelf you made is such a great idea but all the others are so pretty too. I can't wait to see witch direction you choose. The drawer shelf is so cute. Love that. I cannot wait to see all the changes. It was fun to see how your style evolved over the past couple of years! You definitely have a knack for putting pretty displays together. Looking forward to seeing your next move! It must be the time of year we all want to change things up! At least you've got lots of great vintage things to pick from. I know you'll come up with something creative for your kitchen, Carlene!